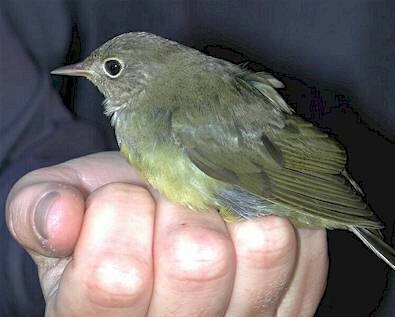 Janice Jarvis caught a Connecticut Warbler September 12, 2001 as part of her work with the Columbia River – Revelstoke Bird Monitoring Station at Machete Island near the Revelstoke Airport. The station monitors the migrations of song birds as they pass through the Columbia valley. Because flooding of the Columbia River reservoirs north and south of Revelstoke have eliminated much of the insect producing habitat needed to fuel such long distance fliers, the wetland around the airport is a veritable oasis for these migrants to stop for food and rest. Recognizing a bird never seen here before requires a special talent. Jarvis realized immediately she had a new bird in hand. “Though it looks much like a MacGillivray’s Warbler, the solid eye ring is diagnostic and it’s a bit heavier,” she said. She has noticed that though the number of birds handled so far this year is more than last year, the kinds of birds moving through suggest migration is happening later than usual, as many species have yet to show up. Connecticut Warblers breed across central Canada extending only as far west as the Peace River country. This capture record is the first in the British Columbia interior, south of the Peace River district. Revelstoke is well known to people who study birds in British Columbia as a hot spot for interesting species. Ovenbirds, Palm Warblers, Chestnut-sided Warblers, Swamp Sparrows and other were not known to exist here until recent sightings from local bird enthusiasts. The migration station began this year’s operation August 1 and has recorded 1817 birds so far. They are caught in mist nets and handled with extreme care. Jarvis has extensive training in the handling of small birds, some that weigh as little as a two dollar coin. She works on a range of bird research projects, collectively referred to as Bird Studies Revelstoke, which includes waterfowl surveys, breeding bird surveys, habitat surveys and Christmas Bird Counts. She operates the migration monitoring station under permit from the Canadian Wildlife Service and is sponsored by BC Hydro, CP Rail, Shell Environmental Fund, Friends of Mt. Revelstoke and Glacier and Parks Canada. The protection of migrating birds is covered by international treaties that limits research and monitoring work to those persons with the proper qualifications. Along with her partner Marie Gallagher and other local volunteers, Jarvis is out everyday before dawn identifying, weighing, measuring and banding these long distance travelers who pass through our community twice a year. 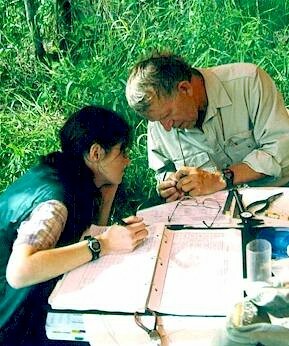 She hopes someday to conduct the same work on the wintering grounds for these birds, which in the case of this Connecticut Warbler, are the tributaries of the Amazon River in South America.